The Dart is pretty much the same as the Arrow, except the paper is folded along it's width, making a shorter plane with the wings pointed in the rear. This plane is well suited to stunts and will not fly very far. 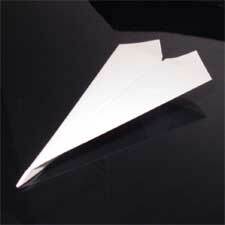 To make this paper airplane you will need only a single sheet of paper and possibly some tape. 1. Fold the paper along the width then unfold it to create a crease along its center. 2. On one side of the paper, fold each corner in towards the center to the point where the inside edges are even with the centerline crease. 3. Starting at the very tip of the point, fold the paper over on each side so the inside edges line up with the center crease. After you have made this plane you may find that it doesn't hold together too well in the rear. Use a small piece of tape along the center fold in the rear to keep it tight. This can be avoided by using smaller pieces of paper. 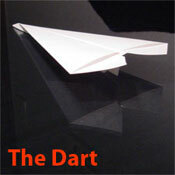 Your Dart may need some fine-tuning before it will fly perfectly straight.